This pet-friendly 3 Bedroom, 2 full bath home sits just on the Orleans / Eastham line. This home boasts a long deck with sweeping views and plenty of outdoor seating for dining and lounging on the deck. The home overlooks a beautiful salt marsh that changes with the light throughout the day. The main living space of the home features a newly-installed ductless-split air-conditioning system; the 3 bedrooms have window-mounted AC units. 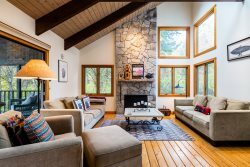 The main floor has a beautiful living room with flat screen TV and vaulted ceilings. There are water / marsh views from this room, the sun room and kitchen as well as the entire deck and the upstairs bedrooms! The kitchen is fully equipped with everything for cooking. It has handsome marble counters and a breakfast bar with high top seating as well as a kitchen dining table. In the next room is a full dining room with seating for 6 plus there is additional outdoor dining for 6 on the deck with a gas grill. There is a stereo with speakers throughout the ground floor of the home for you to enjoy as well! There is one bedroom with 2 twins on the main floor as well as a full bath with stand up shower. Upstairs you will find 2 more bedrooms each with a queen bed and views of the marsh. There is another full bath with a tub/ shower combo on this floor. Plenty of room for a few cars in the driveway. You are about a mile from world renowned Rock Harbor to experience amazing sunsets, watch the boats come in and out or charter a fishing boat for the day! Gas grill (does not require propane; it is plumbed into the home’s gas line). We like quiet & privacy. ...this place is both. Kitchen has everything! the service was efficient and friendly. The feature of picking up the keys at the house through the lockbox was an added benefit. The house is in an ideal location. Isolated, yet within 10 minutes of shopping center. The house is fully equipped, comfortable, and the view of the marsh is fantastic! Heron House is a fantastic place to enjoy your Cape vacation! The home is beautiful, with plenty of room for togetherness-as well as some alone time! It is located on a quiet road, overlooking the salt marsh, but minutes to Orleans and Eastham. Nice outside deck with comfortable furniture and great grill. The home was immaculate, and very well stocked with little things that made our stay as comfortable as home. Loved the information provided by the owner- very clear and helpful. My family enjoyed a fabulous week here and look forward to renting again next summer. Lovely location. Everything in good condition/working order. The generosity of the owner in supplying pantry staples and household necessities was very much appreciated. The deck is large and comfortable. The kitchen is a pleasure to prepare meals in. We look forward to returning next year. 2nd year renting. Love it. Would love to rent next year. We want to let you know what a WONDERFUL time we had at your place .-- It was a very peaceful, relaxing week, spent mostly out on your deck facing the marsh, and at Boat Meadow Beach, walking out at low tide . . . Your place is lovely, comfortable, well-equipped -- made for the ideal vacation. This is a wonderful house, very clean, well equipped and well laid out with lots of private areas for different interests and activities. Cozy franklin stove in kitchen is perfect for chilly evenings. With the house overlooking the salt marsh, it's almost like being right on the beach-- the marsh changes by the hour and is endlessly entertaining. Walking/biking trail is also very close by. House is at end of cul-de-sac, private and safe for kids to play outside. Location is ideal-- in a less crowded part of Cape than Hyannis and Dennis areas, yet not isolated and with shopping and attractions nearby.